The Brit Rock Film Tour is back with its strongest line-up to date. The UK has arguably the richest climbing history and one of the strongest ethical codes of conduct in the world; Brit Rock is quite literally a no-nonsense celebration of this richness. 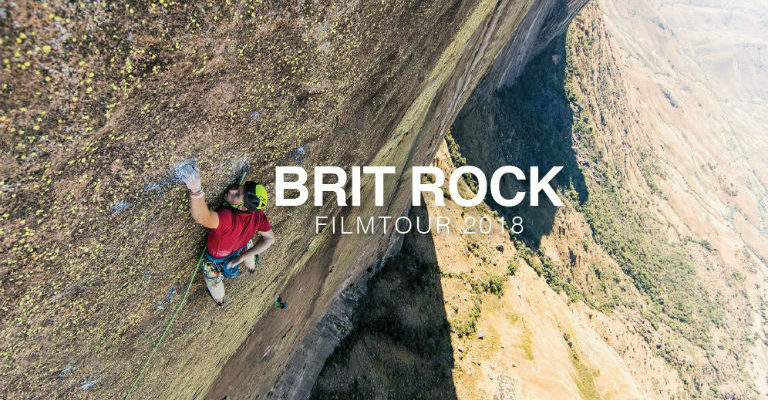 Leading film maker and founder of the Brit Rock Tour Alastair Lee is collaborating with the best of the UK’s adventure film makers as well as his own new productions resulting in this stunning new line up of climbing films. A maverick bunch of Brits go big wall hunting in Brazil. Lead by pioneering legend Mike ‘Twid’ Turner with Steve Long and some youth in the form of the super-strong James Taylor and Angus Kille (just climbed Indian Face! ), the team head for the giant monolith of ‘Pedra Baiana’ dreaming of a new line on perfect rock. From the outset the plan begins to unravel with fuel blockages, wasp attacks, a shortage of equipment and time all pinning back progress in this spectacular and charming film. A wild and entertaining journey through the modern tapestry of what it takes to make a living as a professional climber in today’s world. 30 years ago all you needed was the dole and a carefree attitude, now you need an Instagram account with 10K followers and entry level film making skills. Our lead role is filled by the brash and bold Robbie Philips. 28yr old Robbie has managed to carve a life from what he loves most of all; climbing rocks. With a personal insight into the reality of Robbie’s ‘awesome’ lifestyle, the film focuses on a trip to the mind-blowing big walls of Madagascar where he and his jovial team attempt an adventurous new line.